The Collinsville City Commission will meet Monday, May 17th at 7pm (at the City Hall Annex) for the regular meeting of the Municipal Authority and Commissioners. II. Roll Call (All Present): Mayor Stan Sallee, Vice Mayor Gail Rogers, Commissioner Pam Porter, Commissioner Melodie Bateman, and Commissioner Brad Overholt. 1. Approval of Minutes of the Collinsville City Commission Regular Meeting of May 3, 2004. 2. Discussion about conceptual plans and an update from Jim Graber, Architect concerning the City Hall/Fire/EMS project. Mr. Graber was unable to attend but updated drawings (right) were shown to the commissioners. Field work is completed except survey. Fire Dept. will make temporary move to former recycling plant during construction phase. 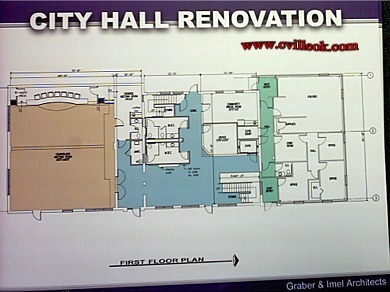 Will likely have different contractors for the Fire/EMS construction concurrent with City Hall rennovation. 3. Discussion and possible action to name an appointee to the Regional Enhanced 911 Board (three year term). Police Chief Charlie Annis was approved for this position with Charlotte Huck as his backup if he is unavailable. 4. Discussion and appropriate action concerning the purchase of two (2) 2002 Crown Victoria State police vehicles from the Kansas State Police for an amount not to exceed $28,500. Financing from RCB Bank with a 36 month lease purchase and interest rate no greater than 4.9% payments to begin, July 2004. 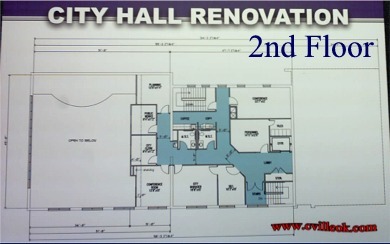 Approved with the amount typo corrected to $28,500 (had been $23,500 on agenda but correct in memo to commissioners). 5. Discussion and possible action for appointment of a budget committee consisting of two BOC/CMA members. Stan Sallee and Pam Porter approved for this committee. 6. Discussion and possible appointment of a commission/citizen committee to recommend use of Vision 2025 Downtown / Neighborhood Improvement Funds. Tentative appointments to this citizen committee are: Memory Ostrander, LuAnn Hennessee, Brad Francis, Ted Wright, Joyce Cribbitt, Dr. Susan Babbitt, and Larry Shafer. Collinsville is to receive $227K. 7. Discussion and consideration of executing legal documents pertaining to a partial vacation of the Plat and Certification of Dedication of the AMERICAN BANK CENTER addition only as the same applies to a drainage easement in said addition. Approved signing a document confirming a previous ordinance for American Bank's lawyer for title clarification. 2. Consideration and possible action on any item that was discussed in Executive Session. No discussion or action after executive session. IV. Roll Call (All Present): Chairman Stan Sallee, Vice Chairman Gail Rogers, Trustee Pam Porter, Trustee Melodie Bateman, and Trustee Brad Overholt. a) Approval of Minutes of the Collinsville Municipal Authority Regular Meeting of May 3, 2004. 2. Consideration and possible acceptance of street, sanitary sewer, and storm sewer improvements in the Southfork III addition and acceptance of the submitted maintenance bonds for said improvements pursuant to the Collinsville Subdivision Regulations. Approved (Note: Mayor Sallee removed him self from the discussion and vote). Three structural fires recently including the loss of the Christian Church and 60% loss at a home in SouthFork. Meeting with ODOT about possible changes to help fund Oklahoma roads and bridges: a possible gas tax to a vote in November is one possibility. This is EMS Appreciation week including a gathering at the Library 7pm Tuesday. Tentative date set for the city surplus auction is June 26th at 10am. Pool opening date is set for Memorial Day (May 31). 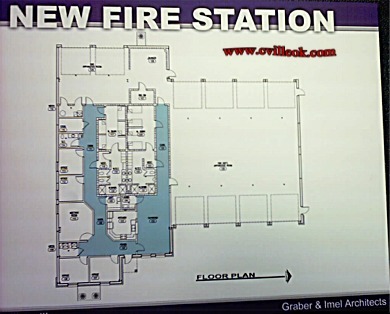 The three Graber & Imel Architects' drawings above are the latest plans for the new fire station / EMS building (west of City Hall) and the 2 stories of the City Hall Renovation.